heavy damage due to the major winter storm 2013. Fallen trees have made the Spicers Forest to Kaukau track impossible and dangerous to pass through. A diversion is in place around Spicer Forest whilst wind turbines are transported along the Spicer Forest track. The route below shows the full track from Broken Hill carpark to the end of Ohariu Valley Road. It is a pleasant track following a streambed through the forest, and despite warning signs to the contrary, the track is gravel and relatively mud-free. From Broken Hill carpark, follow the signs to Kaukau. 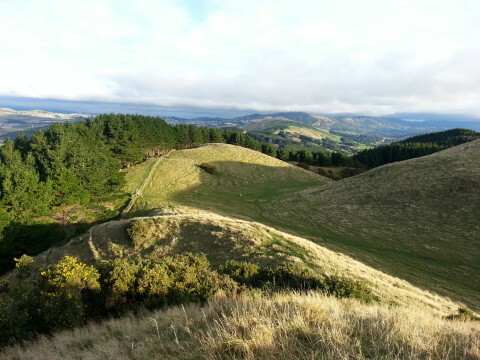 The Colonial Knob track leads left to the south, and goes uphill steeply for about 250 metres. Opening out on to farmland, the track to Kaukau through Spicer Forest is well signposted. Follow the large yellow disks over a style and through the forest. The track is gravel with a good gradient. The muddiest section is on the Colonial Knob track - through the forest the gravel provides a good base and is good for cycling. Emerging at Ohariu Valley road there are several gates to pass through including one with an electric fence and warning of "death" if the grey button is not pressed (you can safely pass through a side gate!). Allow 1 - 1.5 hours to walk from Broken Hill carpark to Ohariu Valley Road. Good parking at Broken Hill carpark. There is no easy parking at the Ohariu Valley Road end, and during the week there will be construction vehicles using the road. This track is temporary, until the Spicer Forest track reopens in 2014.